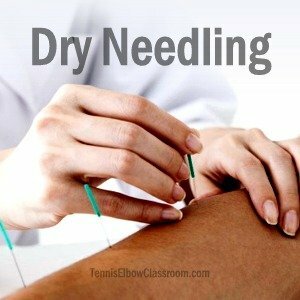 Dry Needling For Tennis Elbow: Who Needs It? 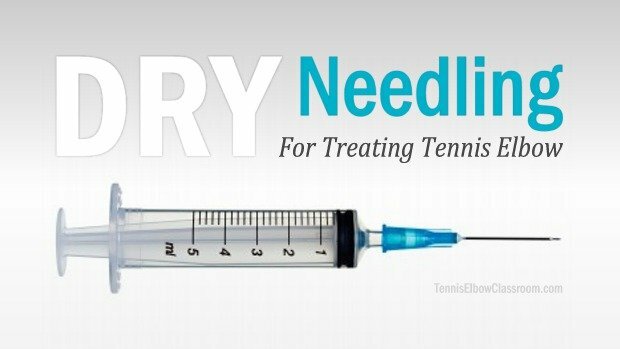 Home » Treatments » Dry Needling For Tennis Elbow: Who Needs It? Dry Needling is a treatment for Tennis Elbow, Golfer’s Elbow and other conditions that involves repeatedly sticking a needle into tissues (usually muscle or tendon) that are not healing properly in the hope of stimulating a healing response. The Acupuncture needle version seems to be the more common practice, by far, and I’ve included a video a little further down, showing the Acupuncture Dry Needle Therapy technique in action. After all, there’s a very big difference – an order of magnitude – between a thin, filament Acupuncture needle and a Medical Hypodermic Syringe! So I’m going to cover separately what I think should be considered two distinct treatments. At the time Dr. Travell was practicing, (and apparently for Karel Lewit) it seems it was standard practice to interchangeably inject anesthetics via Hypodermic Needles into ‘Trigger Points’ in muscle tissues, or to use the same needle to “probe” and treat Trigger Points without injecting anything, hence the term “Dry Needling”. Later, other practitioners began to use Acupuncture needles (which are solid and cannot inject anything) to treat Trigger Points and to treat tendon disorders, like Tennis Elbow and Golfer’s Elbow. What Is Trigger Point Dry Needling? It now seems that Trigger Point Dry Needling almost always refers to the use of Acupuncture needles to treat Myofascial Trigger Points and their associated pain patterns. Int J Sports Phys Ther. 2015 Jun; 10(3): 402–418. For more quotes from this paper see my G+ post below. Here’s a short video showing the Acupuncture Dry Needle Technique in action (also apparently known as ‘Motor Point Dry Needling’ if things weren’t confusing enough! What’s The Difference Between Acupuncture And Dry Needling? Acupuncture and Dry Needling both utilize Acupuncture Needles, they appear to be the same to the casual observer, and many Acupuncturists claim that they are one and the same. Dry Needling VS Acupuncture: What’s The Difference? Many of these practitioners regard Dry Needling as a technique that stands on its own and doesn’t necessarily fall under the auspices of Acupuncture. It doesn’t require any knowledge of Traditional Chinese Medicine, including the Meridian System and its points that Acupuncturists stick needles into. Rather, it can be said to have originated with Western Medical practitioners like Dr. Janet Travell, MD and Karel Lewit. There is definitely controversy brewing, however. Some Acupuncturists – And their State boards – claim Dry Needling is a technique that falls entirely within their scope of practice and no others. To the layperson, it probably seems like a purely semantic argument – And that may be the case. The U.S. Physical Therapy Association apparently advises members in at least seven states, including California, Florida, Hawaii, Idaho, New York, South Dakota and Washington to avoid using Dry Needling, citing recent regulatory decisions or language in existing Physical Therapy licensing laws. The article also states that most of the United States’ 200,000 Physical Therapists have not been trained in Dry Needling, and only approx. 6,000 have taken courses in it. Does Trigger Point Dry Needling Help With Tennis Elbow? The question, of course, is whether this Myofascial Trigger Point Dry Needling approach to treating Tennis and Golfer’s Elbow actually works. I can’t help but think that from my perspective ANYTHING – including doing NOTHING at all and just leaving it alone – would produce a better outcome at 6 months that the standard, “first-line treatment” of anti-inflammatory drugs, icing, and bracing not to mention Cortisone Shots!! These inflammation-chasing, immobilizing and cooling / circulation-reducing “treatments” do more harm than good and slow the healing process, from what I can see. I also have to point out a problem I often observe in many of these studies: They are rarely double-blind, placebo-controlled. Without a placebo group in a double-blind study, one technique or treatment may outperform another, but you have no way of knowing how much of that may have to do with the placebo effect. Ultimately, however, how will sticking a needle in a trigger point treat the underlying causes and dysfunctions at the root of Tennis Elbow or Golfer’s Elbow? From my perspective, and in my experience with treating this vexing conditions over the past 15+ years, trigger points are not the core issue. I’m not denying the existence of Trigger Points. I just don’t see them as the root cause – Rather as a symptom that causes more symptoms in the dysfunctional chain of cause and effect. I see the problem of muscular adhesion formation as a closer-to-the-source issue that needs to be corrected in most cases. These adhesions are like layers of “Velcro” that gradually restrict a muscle’s flexibility and function over time. As this progresses, Trigger Points may very well arise in the muscle, and one can start experiencing a lot of pain and other symptoms at this point. Eventually, the tension, adhesion restrictions, reduced circulation and other muscular dysfunctions takes its toll on the tendon(s) of the muscles, and the tendon starts to break down. It’s at this point, when the tendon is breaking down (degenerating) that one can be said to have “true” Tennis Elbow. Those needles are not going to release the adhesions (which are spread out and are usually present in many layers) and restore full flexibility, circulation and function to the muscle. The only thing that can release stubborn adhesions is some form of deeper manipulation – And I prefer and advocate the hands-on variety. Or you seek out the help of someone trained in them. There’s also the issue of the tendon degeneration (Tendinosis) that so often makes up the core of the injury with Tennis and Golfer’s Elbow. I can’t see Trigger Point Dry Needling helping very much, if at all with that, but that brings us to the other kind of Dry Needling, which may have a lot of potential to reverse it. What Is Hypodermic Dry Needling / Fenestration? The goal of the type of Dry Needling that utilizes a Hypodermic Syringe to treat Tennis and Golfer’s Elbow is to inflict new trauma and bleeding in the tendon to initiate a new healing response. Keeping in mind that the typical case of Tennis or Golfer’s Elbow involves Tendinosis – A degenerative condition marked by an abject failure of the healing / regeneration process. The objective of driving a Hypodermic Needle repeatedly into a tendon that is in a state of degeneration and traumatizing it, is to set off a new round of inflammation and repair, which will hopefully continue and lead to the full repair of the tendon. And let’s not forget the new kid on the block: Stem Cell Therapy. All these “kissing-cousin” therapy techniques are very similar, since Dry Needling will still produce bleeding and bring platelets to the area. Cortisone Shots, in contrast, would be the complete opposite, since their purpose is to suppress inflammation and metabolic activity in the area, and Corticosteroid Injections are known to worsen degeneration – Not help reverse it. How fascinating that Surgeons and other Doctors refer to these types of treatments as “Minimally Invasive” procedures. However, no professional operating within their scope of practice would dare to perform these procedures other than an Orthopedic Surgeon. And surgery is surgery, whether minimally-invasive or not, with all the same risks of infection and unintended consequences. Does “Hypodermic” Dry Needling Therapy / Fenestration Work In Helping Tennis Elbow And Golfer’s Elbow Heal? We don’t really know. There isn’t really enough data or studies yet – even if we include the studies on Prolotherapy and Platelet-Rich Plasma Therapy (article and video). These therapies do look promising, however. They are certainly trying to encourage, nudge – or should we say “JAB” things in the right direction. But I think the question is: Do most Tennis and Golfer’s Elbow sufferers really need to go to this extreme – even if frustrated and desperate? I don’t think most need the needle – especially when factoring in the attendant risks and high costs. Then it will probably make more sense to just have the surgery, since Tennis Elbow surgery has a proven track record of a fairly high success rate IF and when it’s truly called for, which is less than 5% of the time with Tennis Elbow. Although there are invariably cases that are “on the line” and in those cases maybe Dry Needling (or “wet needling,” like Prolotherapy or PRP) will end up making more sense. And check out my premium self-help programs if you have a stubborn injury and want to learn how to treat yourself at home with the most effective advanced self-massage techniques, stretches and exercises. Can Acupuncture Help Your Tennis Elbow Heal? How Braces Slow Your Tennis Elbow Healing! What’s the Best Treatment for Tennis Elbow Relief? Topical Treatments For Tennis Elbow: Lotions, Potions And Creams, Oh My! Lotions, creams, sprays and medicated anti-inflammatory gels are often used to treat Tennis and Golfer’s Elbow symptoms – But can these topical remedies help you heal your injured tendons – Or are they just going to rub you the wrong way? Could Platelet-Rich Plasma (PRP) Therapy be an effective, new Tennis Elbow treatment - A breakthrough, even? - Or is it actually an expensive, unproven fad, driven by rock star-athlete publicity and questionable medical studies? Selfie Elbow 101: What Is It And How Do You Treat It? Who Are The Real Experts In Treating Tennis Elbow? Watch Out: It’s Tennis Elbow Season! What Is Pickleball Elbow And How Do You Treat It? Cortisone Shots For Treating Tennis Elbow: Damaging AND Ineffective? How Long Does Tennis Elbow Take To Heal? Tennis Elbow Surgery: When Is It Time? 10 Tips To Healing Mouse Elbow — Break Your Computer Pain Cycle!